If your house is overrun with ABC blocks, turn them into Christmas tree ornaments for a fun family craft. Blocks are probably beyond abundant in your home, but you might not be quite ready to give them away, so this is a good, green way to bring new life into them. You only need a few supplies for this quick craft, and it's easy to do with your kids this holiday season. 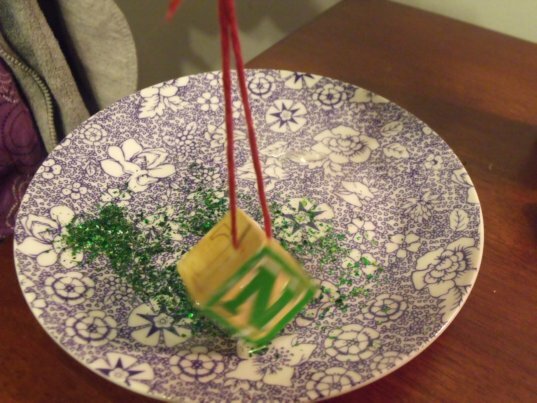 Here's how to recycle your ABC blocks into Christmas ornaments. Send your kids on a hunt for stray alphabet blocks and ask them to gather a few that they would like to turn into Christmas ornaments. While they’re searching through the toy bins and under the bed, you’ll need to gather glue, glitter, yarn, a knitting needle and a drill. Start with the parent-only task of drilling holes in each block. Use a power drill to create a small hole through one corner of each block as shown above. Then using a knitting needle (if you have an older child they can do this part), thread yarn through the block’s hole. Cut the yarn at a length long enough to hang it on a tree branch and then knot the two ends together. 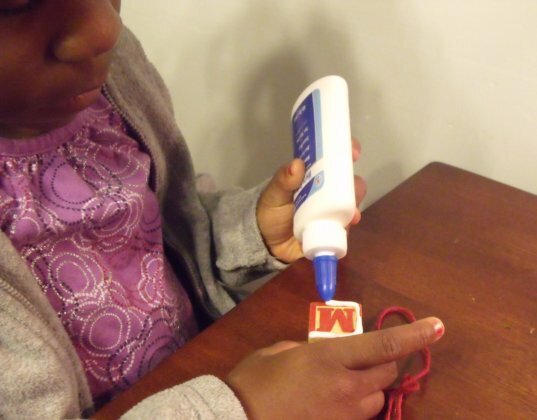 Let your child line one side of each block with glue, simply add glue to the block in any pattern she likes. Then sprinkle glitter onto the gluey portions or pat each block, glue side down, into a plate of glitter. Repeat, adding glue and then glitter to each side of each block. Keep on going until you’ve created enough ABC block ornaments for your tree. 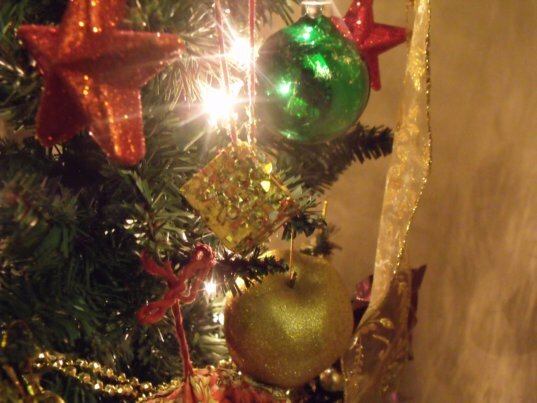 Hang the sparkling recycled ABC block Christmas ornaments on your tree and enjoy! You’ll especially appreciate these keepsakes as your children grow older and most of their other toys and blocks have been passed on to other children. Send your kids on a hunt for stray alphabet blocks and ask them to gather a few that they would like to turn into Christmas ornaments. 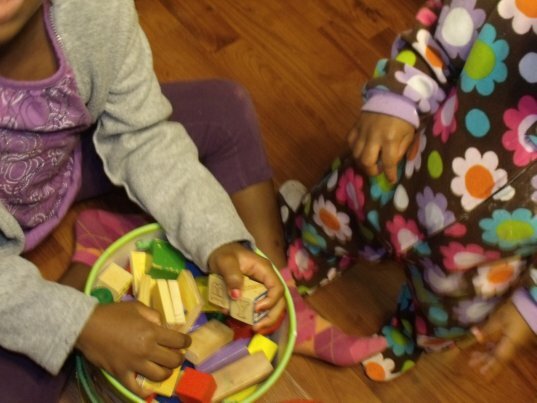 While they're searching through the toy bins and under the bed, you'll need to gather glue, glitter, yarn, a knitting needle and a drill. Start with the parent-only task of drilling holes in each block. 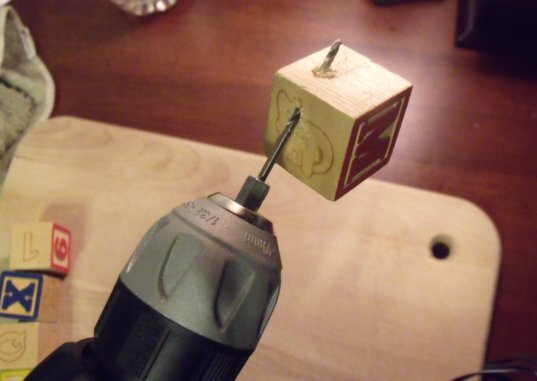 Use a power drill to create a small hole through one corner of each block as shown above. Then using a knitting needle (if you have an older child they can do this part), thread yarn through the block's hole. Cut the yarn at a length long enough to hang it on a tree branch and then knot the two ends together. Then sprinkle glitter onto the gluey portions or pat each block, glue side down, into a plate of glitter. Repeat, adding glue and then glitter to each side of each block. Keep on going until you've created enough ABC block ornaments for your tree. 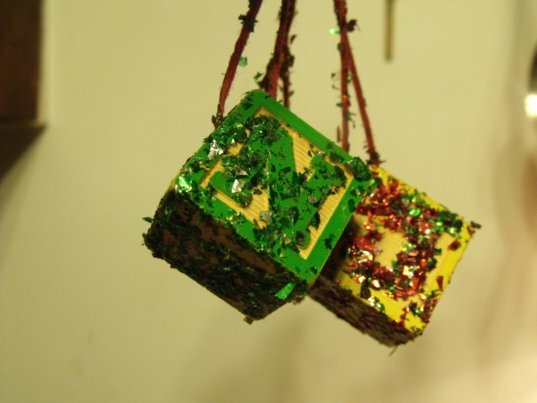 Hang the sparkling recycled ABC block Christmas ornaments on your tree and enjoy! You'll especially appreciate these keepsakes as your children grow older and most of their other toys and blocks have been passed on to other children.